To redeem your new Celestion Two notes IR license key/s follow the instructions below. Download and install the Wall of Sound plugin setup. If you don’t know which format to use, go to this page. Launch your sequencer, and select “Torpedo Wall of Sound” from the list of available effects in your sequencer. If you don’t have a Two notes account, press “Sign Up”. You will be asked to enter personal info to create your account. A validation email containing the info you entered will be sent to you. If you already have a Two notes account, press “Sign In”. 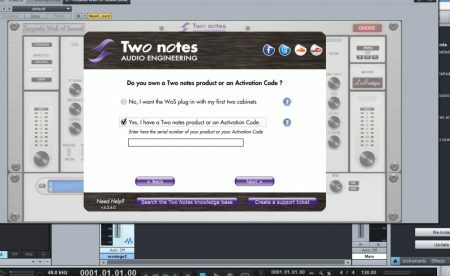 You will be asked to enter your Two Notes account personal details to activate the plugin. You will find it in the latest Two Notes email you received. After registering you will be have the following window where you will input the activation code of your Celestion product. Once entered, the latest license file and the Two Notes cabinet files you own are automatically downloaded.